Do not miss another LIfeStride voucher! Simply leave your e-mail address and we'll always keep you informed of new vouchers for LIfeStride. 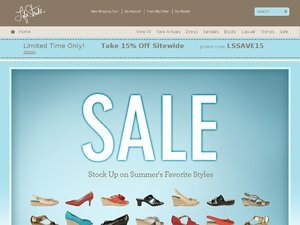 15% discount on Sandals Plus Free Shipping with Code: SANDALS15! Fourth of July Sale! Take 20% discount on Plus Free Shipping with Code: FIREWORK20! Take 20% discount on Sitewide Plus Free Shipping with Code: SAVE20FS! Memorial Day Sale! Take 15% discount on Plus Free Shipping with Code: SUN15! Take 15% discount on Plus Free Shipping with Code: BRIGHT15! 20% discount on Casual Shoes Plus Free Shipping with Code: CASUALS20! Take 20% discount on Dress Plus Free Shipping with Code: BESTDRESSED! Friends and Family Sale! 30% discount on Sitewide Plus Free Shipping with Code: SHOPHAPPY! Flash Sale! Take 25% discount on Plus Free Shipping with Code: LSFLASH25! Latest voucher code valid at a time of promo publication was entered to be working from 2018-10-18.